GOLDEN Horses Development Bhd (GHD), a private firm owned by Tan Sri Lee Kim Yew, aims to launch its RM600 million Palace Residence Suite this year and market its property to Asian investors. Palace Residence is located at the Mines Resort City in Seri Kembangan, Selangor. It is being launched a year behind schedule due to the recession in 2009. There are more foreigners now, setting their eyes on new properties here, said Golden Horse Palace Bhd (GHPB) executive director Dianna Lee. "We have received a few enquiries on the property. There are people keen to buy. 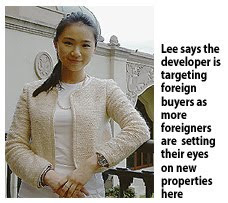 We are targeting foreign buyers and have appointed an international real estate agent," Lee said in an interview with Business Times recently. GHD and GHPB are sister companies, which means that they are both owned by the same major shareholder. GHD is targeting a June launch for the suites in Singapore, followed by Hong Kong, China and Malaysia towards the end of the year. Palace Residence will offer 226 one-bedroom suites with a built-up area of 500 sq ft, and 156 two-bedroom suites, ranging from 1,100 sq ft to 1,400 sq ft, as well as four penthouses. The suites are selling for RM900,000 to RM1.4 million each. The 19-storey Palace Residence, which is a combination of a hotel and condominium, will complement the 480-room Palace of the Golden Horses. Palace Residence will be built next to the five-star hotel and they will be connected by a bridge. GHD will include free golf membership, worth some RM800,000, in the property sale. Buyer will automatically be a resident gold member at the 18-hole golf course at the Mines, Lee said. Construction will start in the second half of 2010, and is due for completion within three years. Lee said buyers can lease their units to GHPB to manage, with guaranteed returns of 7 per cent for the first two years. The indicative selling price for each suite a night is from RM800. GHPB is the hospitality, leisure and health arm of Country Heights Holding Bhd (CHHB). It manages three resorts - Palace of the Golden Horses and Mines Wellness Hotel, located within the Mines, and Borneo Highlands Resort, Sarawak. The Mines, the country's first resort development, is a project by CHHB, in which, the senior Lee holds 48.1 per cent stake. Bolton Bhd is targeting a gross development value of RM1 billion from four new properties to be launched this year. Executive Chairman Datuk Azman Yahya said the four new properties would be located in prime locations. "The much-awaited "Sixceylon" development in Jalan Bukit Ceylon will be launched in June," Azman said during the unveiling of the project here today. The Sixceylon will be built on where the current Bolton Court is located. The existing 12-storey Bolton Court, completed in the late 1970s, will be redeveloped and transformed into a modern development comprising a 33-storey apartment building priced between RM600,000 and RM1.2 million per unit. The Bolton Court, with its design and location was well received by the expatriate community and many leading multinational corporations and foreign dignitaries have known it to be their home when in Malaysia, Azman said. "Although Bolton Court has contributed significant investment income for Bolton over the years, we believe the time is now right to redevelop the old and tired-looking building," he said. He also said the recent increase in interest rate is not expected to have a significant impact on the sales of property. "The increase of 25 basis point is still small," he said. "What is important is that there must be confidence that the financial market continues to support property projects," he added. A group of established and reputable property developers and real estate agencies from Australia showcased their projects at the ONE Australia Property Fair which was held on March 6 and 7 at Cititel Mid Valley, Kuala Lumpur. Organised by Cyan Event Management, the fair showcased over 15 new prime projects in major cities such as Melbourne, Sydney and Perth, as well as the state of Queensland . There were diversity in types of property presented, from luxury waterfront projects to affordable student-apartment units and also townhouses, landed properties and commercial units. Visitors were treated to a seminar titled “ONE Australia Property Seminar” which featured a series of interesting topics such as Investing In Australia - Your Choice of State, Property Investment in Western Australia, Australia - Your Migration Options, Living & Studying In Australia, and Transparencies and Clarity in Understanding Australian Property Investment & Finance. Guest speakers include Marcus Gilmore, Samantha Payne, James Tan, Danny Ong and Leonard Ng. “Overall, our exhibitors were satisfied with last weekend's One Australia Property Fair. Many said it attracted more quality visitors than other South East Asian exhibitions promoting Australian properties,” says Yong. GEORGE TOWN: A five-star hotel, a convention centre, a hospital and high-end condominiums are among the projects lined up by the CP Group for its Queensbay site. CP Group executive director Datin Jane Yeo said these projects would be located on the remaining 35 acres (14ha) of the total 75 acres which has yet to be developed. "These projects will be the cream of our total development of Queensbay," she told a press conference after the official opening of Eastin Hotel Penang. "To date, the gross development value (GDV) is more than RM1 billion, including the Eastin Hotel. We will launch Parcel 4 by the end of this year which will be a condominium project with a GDV of RM500 million,"
Yeo said talks were underway with interested parties to set up the hospital while plans for the convention centre were also being finalised. She added that CP Group was also looking at expanding the Eastin Hotel brand both locally and abroad, either on its own or in collaboration with other parties. With an investment of RM130 million, Eastin Hotel Penang is the first extension of CP Group's flagship hotel in Petaling Jaya. The 14-storey four-star business class hotel with 328 rooms is located next to Queensbay Mall, which was part of the white knight package of the abandoned Bayan Bay project by the CP Group in 2004. Since its opening in November 2009, the hotel has been enjoying 78% occupancy. CP Group executive chairman Datuk Tan Chew Piau said in his speech that despite facing uncertainties during the 2008 financial crisis, the group carried on and speeded up construction activities instead of slowing down as most industry players had done. "We finished the hotel in a record time of 15 months," he said at the official opening of the hotel by governor Tun Abdul Rahman Abbas, which was also attended by Chief Minister Lim Guan Eng. Lim, meanwhile, proposed that a hospitality school be set up in Penang to cater to the demands of new hotels coming up in the state. "According to statistics from the Tourism Ministry, the hospitality industry in Penang has shown an upward trend the past five years in hotel guests from 4.1 million in 2004 to 6.3 million in 2008, an increase of 53% over the past five years. "There has also been a significant increase of hotel guests in Penang from the domestic market from 2.1 million in 2004 to 3.4 million in 2008," he said. PERMAJU Industries Bhd, a timber company and car distributor, is diversifying into property development by buying 70 per cent of Har- die Development Sdn Bhd for RM33.68 million cash. Hardie is jointly developing an integrated commercial and residential properties known as Princess Heights in Sabah. Permaju is buying the firm from Datin Pang Fook Kyun and Andrew Sim. It will use internal funds and borrowings for the deal, due to be completed by the third quarter of this year. Pang is the wife of Datuk Lim Yen Ngiap, a substantial shareholder of Permaju. YTL Hotels expects Pangkor Laut Luxury Resort, Residence & Spa Village, a resort development on The World in Dubai, to pave the way for similar developments outside the region. It currently manages a collection of award-winning resorts and hotels in Southeast Asia. "It's a fantastic opportunity for YTL Hotels to lend its brand for a world-renowned development. The exposure will be good for us as we look to expand," the resort manager for Pangkor Laut Resort, Jeffrey Mong, told Business Times in an interview. The World, an idea conceived by Sheikh Mohammed bin Rashid Al Maktoum, the ruler of Dubai, is a man-made archipelago of 300 artificial islands constructed in the rough shape of a map, located 4km off the coast of Dubai. The islands composed mainly of sand dredged from Dubai's coastal waters. Individual islands have been sold by the developer, Nakheel Group, for US$15 million to US$50 million (RM50.1 million to RM167 million). Investors from Kazakhstan and Russia bought five islands to develop Pangkor Laut Luxury Resort, Residence & Spa Village. A partnership agreement was signed between the investors and YTL Corp Bhd in 2008. YTL Hotels, the hospitality arm of YTL, was invited to bring its luxury hospitality to Dubai by licensing the brand Pangkor Laut and Spa Village for the project. It was also appointed the sole operator for the resort, and to set up and manage the five-star spa. Mong said the partnership will help the company's employees to learn and experience the management of a world-class asset. Construction on the project, modelled after Pangkor Laut Resort, is half way and it will be ready by 2012. This will be the first time YTL Hotels will manage a property without an equity investment. Pangkor Laut Luxury Resort, Residence & Spa Village will offer a lifestyle package combining luxurious villas, townhouses and apartments, boutique restaurants and retail outlets. The Pangkor Laut Luxury Resort will offer 120 deluxe guest rooms, 20 fully equipped luxury beachfront villas, shopping gallery, aqua park and an underwater nightclub - a first for Dubai. The residential component, Pangkor Laut Luxury Residence & Spa Village, will offer 92 fully furnished apartments, 27 attached three-bedroom villas with a private pool, 34 independent luxury villas with private marinas, a community centre and spa. PETALING JAYA: YTL Corp Bhd’s wholly-owned subsidiary YTL Hotels & Properties Sdn Bhd has entered into an agreement to purchase a Japanese village resort for 6 billion yen (about RM222mil). In a filing with Bursa Malaysia yesterday, YTL said the proposed acquisition would enable the group to participate in one of Japan’s finest ski resort destinations on Hokkaido island with potential to develop into a world class four season resort through luxury residential development and mountain retail development. “The proposed acquisition is not expected to have an immediate material effect on the earnings, net assets and gearing of the group for the current financial year. However, it is expected to improve the earnings of YTL Corp in the longer term,” it added. YTL Corp Bhd is entering into an agreement with several parties which will ultimately see the company participating in one of Japan’s finest ski resort destination. The conglomerate, through its wholly-owned subsidiary, YTL Hotels & Properties Sdn Bhd, will acquire 496,184 shares, representing 100 per cent of the equity interest in Niseko Village from PC One YK (PC One), a Japanese limited liability company. UOA Real Estate Investment Trust (REIT) is considering buying two office blocks in Kuala Lumpur for RM500 million. It received an offer from UOA Holdings, a substantial unitholder in UOA REIT, for the sale of Parcel B Menara UOA Bangsar and Wisma UOA Damansara II, priced at RM289 million and RM211 million respectively. "The board of directors of the manager (UOA Asset Management Sdn Bhd) and OSK Trustees Bhd (trustee) will deliberate on the terms and conditions contained in the offer letters and a further announcement will be made upon completion of the deliberation," UOA REIT said in a statement to Bursa Malaysia Bhd. Parcel B Menara UOA Bangsar, located in Jalan Bangsar Utama 1, comprises a tower block with 15 levels of office space, three levels of retail podium, six levels of elevated car park and four levels of basement parking. The newly completed commercial and retail property, which has a 99-year leasehold tenure, is 88.5 per cent occupied. Wisma UOA Damansara II, located at Changkat Semantan, comprises a 16-storey office building and five levels of basement parking. The two-year-old freehold property, used for commercial and retail purposes, is 87 per cent occupied. The purchase of Parcel B, Menara UOA Bangsar, will involve a refundable deposit of 0.01 per cent, or RM28,900; a cash payment of RM156.03 million; and the issuance of 102.26 million new REIT units. The purchase of Wisma UOA Damansara II will also involve a refundable deposit of 0.01 per cent, or RM21,100; a cash payment of RM113.92 million; and the issuance of 74.66 million new REIT units. Diversified palm oil group Kulim (Malaysia) Bhd plans to dispose its investment property, Menara Ansar, in Johor Baru for RM105 million. The divestment will be satisfied part cash with the company set to receive RM63 million, said managing director Ahamad Mohamad in statement today. The remainder will be via the issuance of 42.9 million new units of Al-Aqar KPJ Real Estate Investment Trust (REIT) at an issuance price of RM0.98 per unit. Ahamad said Kulim had opted to dispose its investment in Menara Ansar as it would allow the group to unlock the value of its non-core assets as well as realise its investment in the property. "The divestment will allow us to utilise the proceeds for repayment of borrowing, which currently stands at RM1.7 billion, and lower our gearing from 0.33 times to 0.32 times," he said. On the Al-Aqar REIT, which is the world's first listed Islamic REIT and Asia's first healthcare REIT, Ahamad said it would be a good investment for the group as it has been providing stable and respectable dividends for the last two years. As at Dec 31, 2009, Al-Aqar has an existing fund size of 518.37 million units with current assets totalling RM49.81 million and a real estate portfolio of RM961.5 million. Kulim has accepted the offer to dispose Menara Ansar from AmanahRaya Trustees Bhd, which is the trustee of Al-Aqar REIT. The transaction is scheduled to be completed by the third quarter this year. Menara Ansar, built on 9,739 square metres of freehold land, is a 21-storey office space with a three-level basement car park. To date, it has an occupancy rate of 92 per cent.